Material on this web site copyright © 1995-2011, TelePost, Inc. All rights reserved. Remote control software and hardware combination. LP-Remote is a limited run product. I keep PCBs and many of the parts on hand, but order things like the LCD and relays as I get orders. Contact me for pricing information at email. The LP-Remote board is available as a kit or assembled. Expect about 2 weeks for delivery. The LP-Remote board is available in kit or assembled form. Email us for details on pricing/ordering. The Manual for LP-Remote covers assembly (for the kit version), setup and operation of both the hardware and software. You can access it in html format here, or in pdf format here. 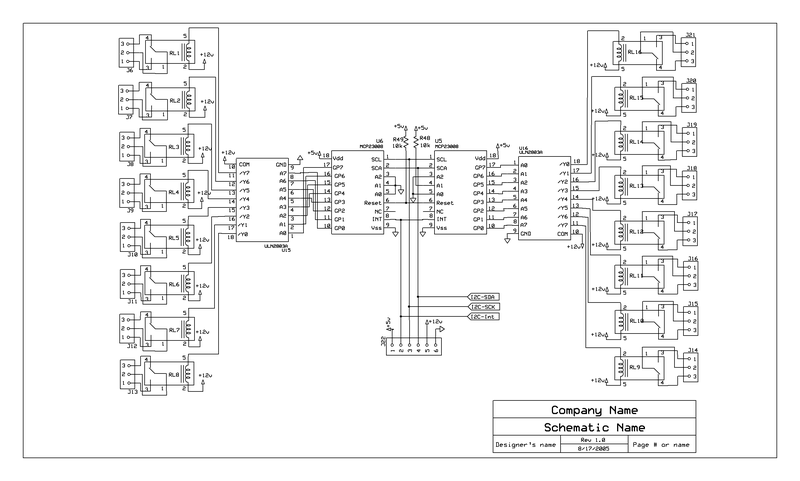 To download hi-resolution schematic pages, right click here and here, save to disk and then open with MS Paint and print. The current version of LP-Remote firmware is version 1.04, and LP-Remote software is 1.05. We are beta testing a new application which allows programming of relays through macros which provide the capability of sequencing groups of relays with a single button press. The version shows the status of up to 64 relays, and allows the relays to be individually toggled by pressing the status buttons in addition to using a macro button to control them. Below is a picture of the new program showing 32 relays. Both software panels allow for full customization of meters, buttons etc. The windows can be collapsed to eliminate the meters and sliders if desired, or expanded to show serial comm data for troubleshooting. The relay buttons light to show the actual remote relay driver status... We don't assume commands were received at the remote site! A/D update rates are adjustable from 100 milliseconds to 2 sec. All 6 meters are sampled at the same time, as well as the digital status inputs. There is a flashing "Connect" indicator to verify the remote connection and speed. The software displays transmitted frequency, and the frequency counter can also be used as a reset input for the watchdog timer. Board temperature is also displayed in degrees F or C.
The program will work with desktop remote control programs like pcAnywhere, winVNC and XP Remote Desktop of course. And, as always, will be able to be used with serial device servers as documented in the Remote Control of Networked Station Equipment section of my website. Below is an example of the setup page. In addition, we plan to offer automatic relay selection based on frequency (using the board's frequency counter) and the option to pulse the relays. We hope to release a fully functional version of the program in the near future. With this design, the relays can be controlled in any combination to handle a variety of tasks, including antenna tuning, direction switching for antennas like the 4-square or beverage, routing of transverters, etc. In this example linear amplifier bandswitching is handled by band data hardwired from the rig, but relays could be used as well. The Manual for LP-Remote covers assembly (for the kit version), setup and operation of both the hardware and software. You can access it in html format here, or in pdf format here. 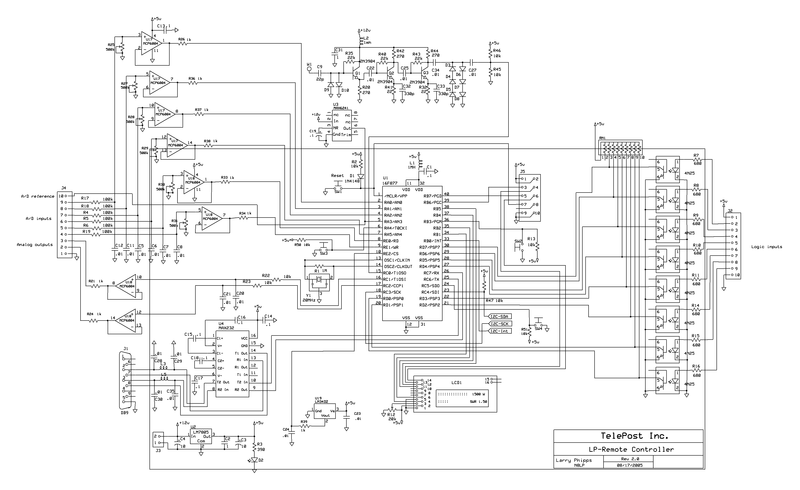 To download hi-resolution schematic pages, right click here and here, save to disk and then open with MS Paint and print. A basic help file on how to use the beta is located here. To use the beta, first install the standard full version and make sure it works. Then download and unzip the beta. You will have a new LP-remote.exe file after unzipping. Rename the LP-Remote.exe file currently in your LP-Remote folder to something like LP-Remote.old, and then place the new LP-remote.exe in the same directory. On the Setup page, select the Macro A tab. Enter a name for the first macro (or leave the name as Macro1). Enter a string of relay numbers to turn on, and/or a string to turn off. The relay codes must be two digits, and are one number less than the relay number, ie. Relay 1=00. Use a comma between relays, and a semi-colon at the end. Don't use spaces. For instance, to turn on relays 1 thru 3, type 00,01,02; in the On box To turn off the same relays, type in the Off box instead. On box = 00,01,02; and Off box = 06,07; would turn on relays 1-3 and turn off relays 7&8. If you enter the same relays in both boxes, it will cause those relays to toggle each time you click the button for that macro, BUT be careful that you don't use those relays for anything else, or they could get out of sequence. It's safer to not use the same relays in both boxes, but you should be able to use the toggle function with a little care. You can click on the status buttons for the relays instead of a macro button if you want to toggle that relay only, but you'll have to remember what the relay controls. The status buttons work like the old relay buttons, but don't have names... just numbers. You should program macros for all the functions you used to use. One warning for existing users... this software only works with firmware v1.0.4. Some of the defaults may not appear until you use the new functions so that their state can be saved in the Registry. Here is a picture of the production board mounted on an aluminum panel. It is silk-screened and solder masked for easier assembly of the kit version. The relay outputs are on the top and bottom right of the board, the expansion port is on the right edge, the digital inputs and analog inputs/outputs are on the top left, the +12v power, frequency counter input and serial port are on the left edge. The board provides screw terminals for all I/O connections, allowing easy custom installation to meet the users needs. All critical parts are socketed. I tried to isolate the board from the shack as much as possible, using dry relay contacts, opamps and opto-isolators. The analog ports are all opamp buffered as well to protect the PIC from dangerous signal levels, and provide hi-Z inputs. The large LCD screen, in addition to the Home screen shown above, is used for setting up and monitoring the board. The six screens below show analog inputs, digital inputs, analog outputs, relay status for relays 1-16 and 49-64... and frequency counter calibration screen. 16 10A SPDT relays, expandable to 64 in groups of 16 with additional relay expansion boards (expansion boards are special order). Built-in 30 mHz frequency counter with either 50 ohm, -30 dBm to +20 dBm input range or 10mW to 150W hi-z bridging. The Manual for LP-Remote covers assembly (for the kit version), setup and operation of both the hardware and software. You can access it in html format here, or in pdf format here. Below is a picture of one of the first boards installed at KP2A. 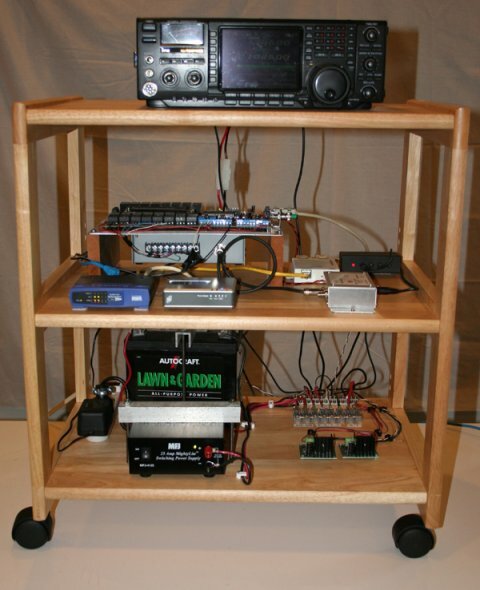 I provided John with an LP-Remote board with a Lantronix UDS200 serial server, interfacing for AC line voltage, charge state of the deep cycle battery that powers the station and a Top Ten devices antenna switch. The Lantronix also provides rig control. I will provide details of the protocol for communicating with the LP-Remote board so that you can write your own software if you like. 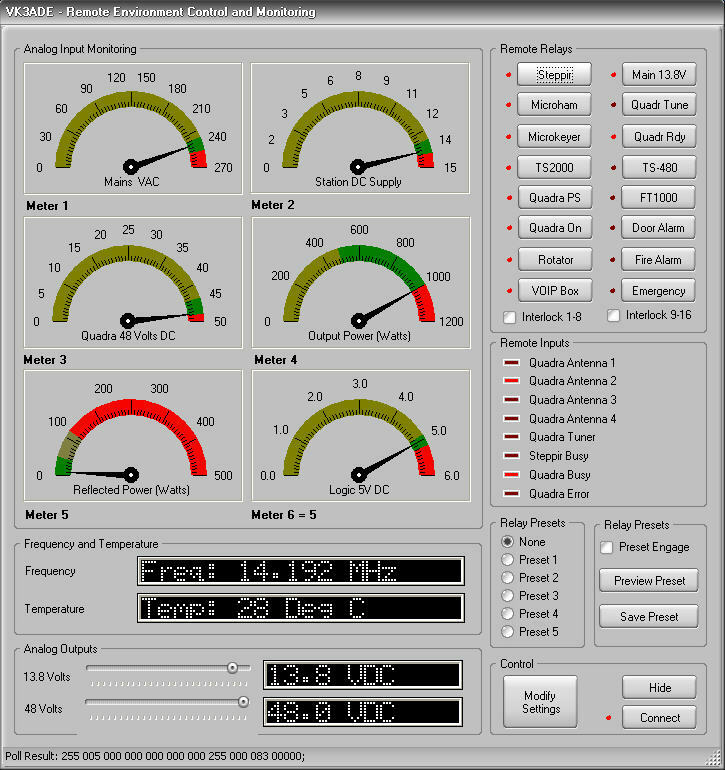 Here is a screen grab of the software written by VK3ADE for his LP-Remote board. This is one of the nicest looking pieces of control software I have seen. Great job, Roger!